Wind: Variable all day but they didn't help or hurt - we were climbing. There was a wicked cross wind for the last three mile downhill run into town. 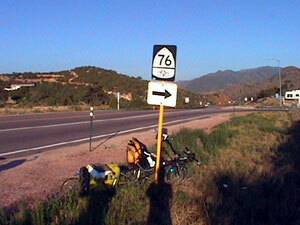 Boy, am I glad I got that granny gear chainring in Canon City! I did some very serious climbing today up into the sky. Joe and I are still riding together. We started out at about 6200 feet and ended up climbing to nearly 9500 feet. 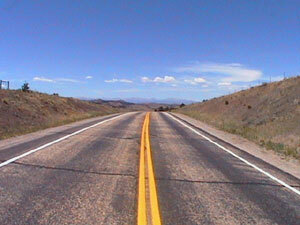 There wasn't much along the route and the traffic was fairly light. We now measure riding success in feet instead of miles. 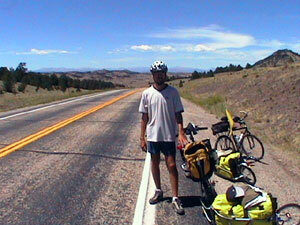 Even though I only rode 51 miles I climbed to a final elevation that is over 2700 feet above the starting elevation. 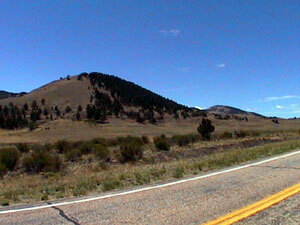 Riding at this elevation is tough because the air is thin. Breathing is a littlle difficult, muscles fatigue easily, and I have a feeling of light headedness and euphoria. These are common symptoms of working out at high elevation. Luckily I've worked up to this elevation slowly instead of just flying in. I haven't felt ill or dizzy which is good. 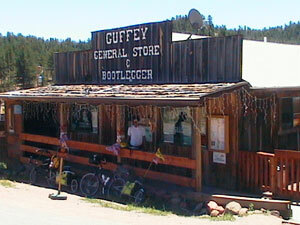 We had lunch at a very small town about one mile off route called Guffey. 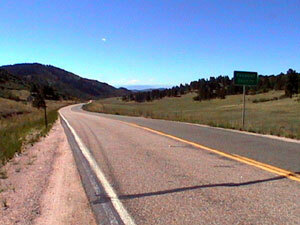 The town has an official population of ten people and sports a very sparse collection of buildings including a tiny regional school, a post office, and a building with a bar, restaurant, and general store. We ate at the bar and had some very serious and excellent Angus burgers. It turns out that the owner is from Gettysburg, Pennsylvania and one of the other guys that was there is from Lewistown, Pennsylvania. Both towns are within a few hours drive of my home. 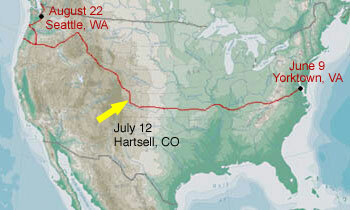 Tomorrow we'll climb over Hoosier Pass, the highest point on the route at over 11,500 feet. 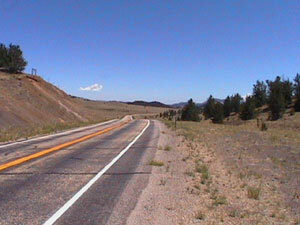 It's then a general downhill run for about 60 miles into Kremmling. Here are two interesting pictures. 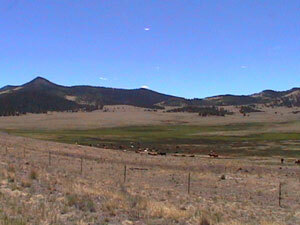 The first shows a pasture full of longhorn cattle. The second shows how the trees only grown on the north side of hills and mountains around here. Most trees are fairly short and are almost exclusively evergreens. 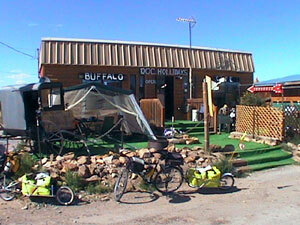 We ended up in Hartsell, Colorado at this awesome place called Doc Holliday's. It's a restaurant/internet cafe that serves bison burgers, steaks, and hot dogs as well as elk burgers. This is a great hang out where I got a chance to take care of my e-mail, look up a hostel in Silverthorne for tomorrow, and write this log. Next door is a bar where the owner is very close minded. They throw people out they don't like and write their name on the wall. They call it being "86ed" and it's a local joke. In response, Doc Holliday's ends their prices all in 86 cents. What a unique, great place! We camped out back of the restaurant since the cabin rentals in town are $70 per night. We met a dude named Ziggy who is an eastbound rider. He's a pretty crazy dude who claims his home is his bike although his parents live in Florida. He piched his tent with ours and will head out in the morning. We probably won't talk to him in the morning because he sleeps in.